This’ll make it easier to find things you absolutely need. They won’t get missed under loads of other boxes and they’ll seriously come in handy in the likely event that you’ll be too tired to get things organized on the day of a move. Essentials like toothpaste, dish soap, and lotion are a pain to find when they’re packed with a bunch of other items. This will make it easy to get through the next day or so. Because no one really unpacks everything on moving day, and if you’re a procrastinator (no judgment! ), it’s unlikely that you’ll unpack everything within the week. Check out our informational post on what and how to pack an essentials box for every room of the house. This moving day tip is a must for large closets. Just slip a garbage bag over a group of hanging clothes. Then tie the bag up to keep the hangers secure. It’s that easy! This is the key moving day tip to keeping your sanity when you start to pack. And be sure to pack like things. No mixing! It’ll make your life easier in the long run. If they spill, at least they won’t be all over everything else. This way, on move-in day, you can easily (and neatly) put your clothing in dresser drawers. Moving on a Saturday can get tricky, especially if you are moving to an urban area. Instead, try moving during a weekday. It’ll be easier to move around—and find parking—when most residents aren’t at home. First, make sure you do some research and check out the moving company’s reviews. Then, we suggest giving the company a call versus just getting a quote online. A positive phone call experience is a good indicator of whether or not the company puts the customers needs first. Plus, it’s easiest to find out whether or not they’re flexible or a good fit for your need. Here’s a helpful blog post on what to ask professional movers before you hire them. 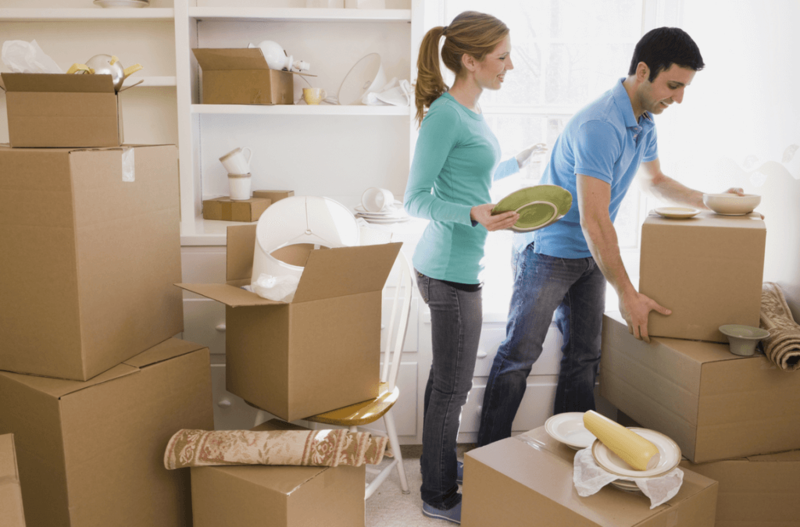 Over the course of a month (or even earlier), you should begin to pack your home. Dedicate weekends or certain weekdays to tackling a particular room, out-of-season clothing—or just a set of cabinets. By breaking up packing responsibilities, you won’t feel overwhelmed. Calendaring pre-packing responsibilities will help you stay on track, too. Instead, rent Smart Bins which are plastic moving boxes. They don’t require tape and they hold much more weight than traditional cardboard boxes. Plus, plastic moving boxes are free when you move with Smart Price Moving. Check out this blog about why plastic moving boxes are better than cardboard boxes for moving. Most companies will let you schedule well in advance, so it’s easy to mark this off of your master to-do list early. You’ll want to do this after you move out of your old home and before you move into your new home. Take care to take photos of any outstanding dings or damage, and be sure to bring it up to the landlord. This will prevent any undue charges. It’s much safer when transporting. You can also use your (massive!) supply of plastic grocery bags to create additional padding. This will make it easier to put things together if you’re moving on your own. After you break down your furniture, place corresponding nuts, bolts, and nails in clearly labeled zip lock bags. Moving into a new apartment is indeed stressful. Having a checklist is really essential to help your move more organized and fast. You can also get additional tips when moving that can really help you with this blog I read http://www.avivmovers.com/movingguide/moving-tips/. Thank you for sharing this great post! Moving to a new home or apartment is indeed stressful. That is why hiring professional movers are recommended. Hiring a moving company will help you lessen the stress of doing the task you need for your moving. Thank you for sharing this helpful information!